Some pictures from a day trip (there and back with no overnight stay) to bury Virginia Wilson's remains (interment of her ashes). 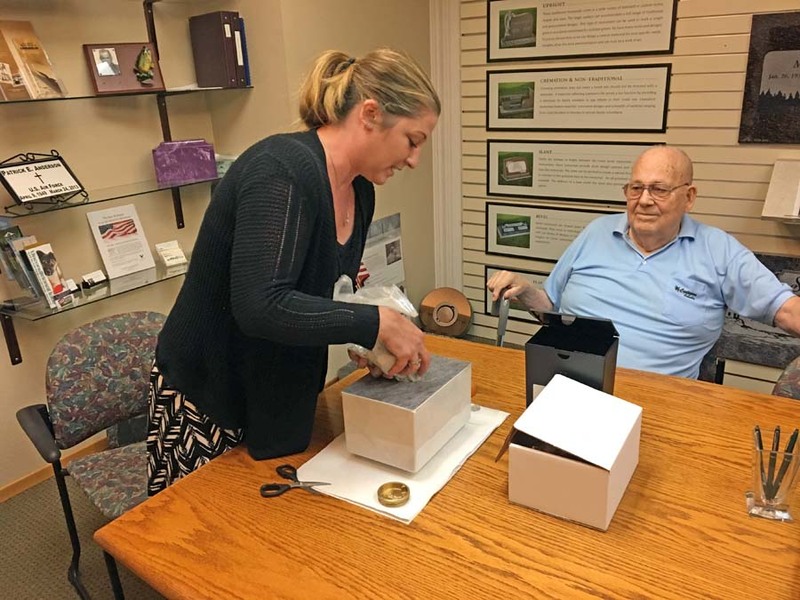 Virginia passed away December 23, 2016 but her body was donated to science so comes back cremated eventually. This was a small family thing to place her in the ground. Click on any picture below for a higher quality original. This trip was on Saturday, July 27, 2018. 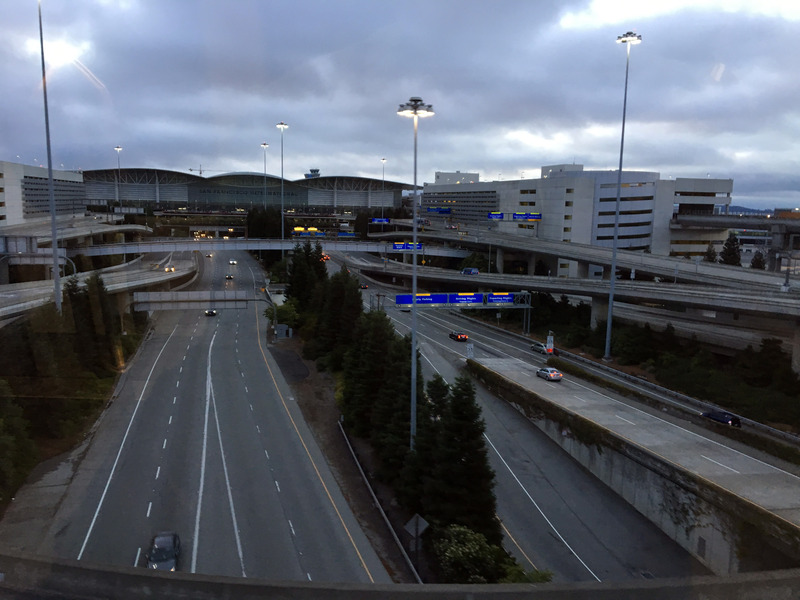 We like to park in "International Parking" at SFO and take the "Air Train" to the terminal. Here we are on the "Air Train" circling around to the terminals. Click here for a movie and here the second half of Katherine getting a pat down by TSA. 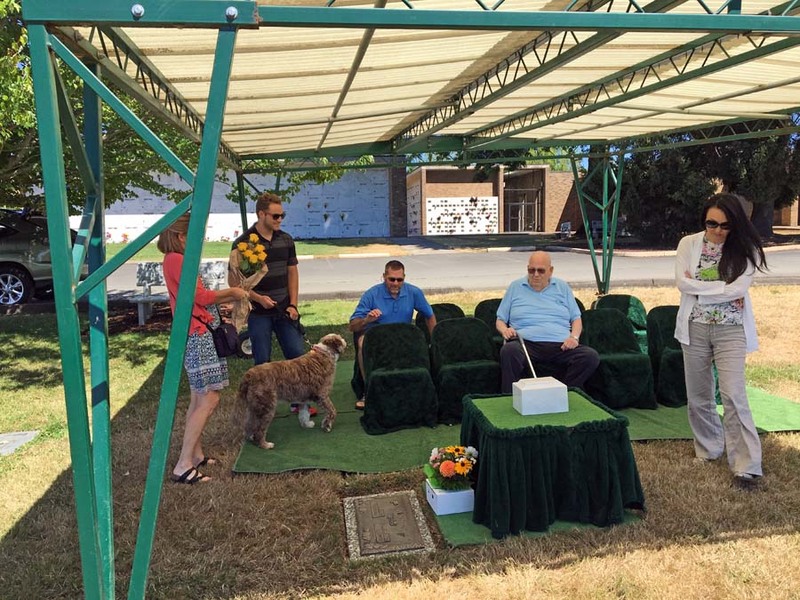 Several of our close family are bured at "Restlawn Memorial Gardens" located at: 201 S Oak Grove Rd NW, Salem, OR 97304. 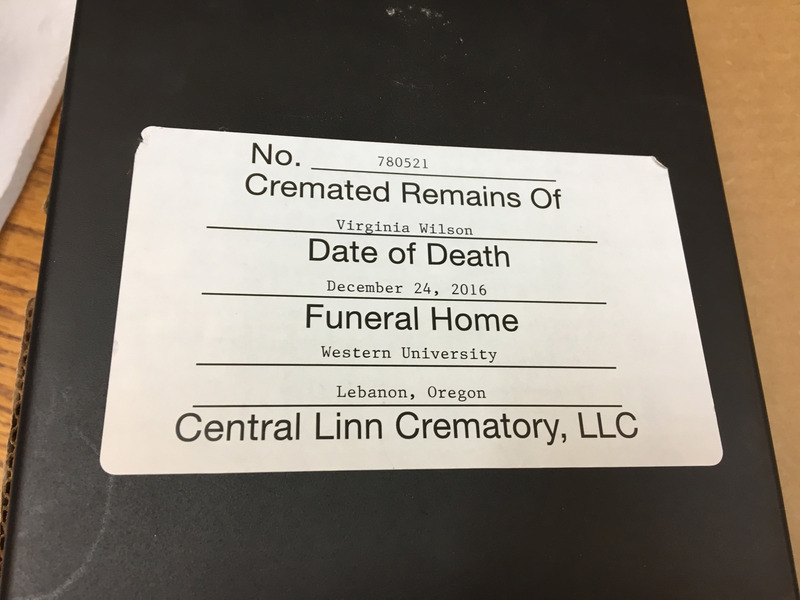 The first step was transferring the cremated remains from the plastic container to the final urn (casket?). 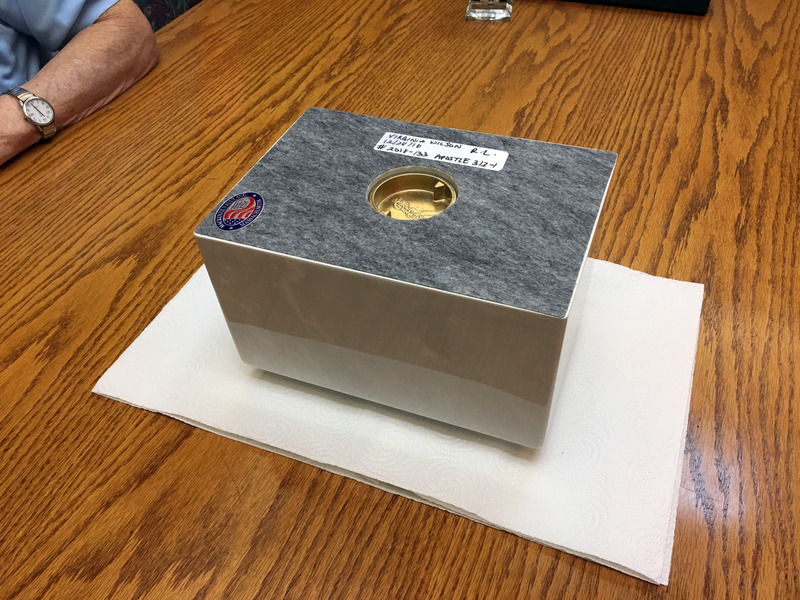 Below is the plastic container. The transfer to the final casket. The screw in lid is then cinched by a machine. A small medal medallion with Virginia's identification was placed inside before it was sealed. 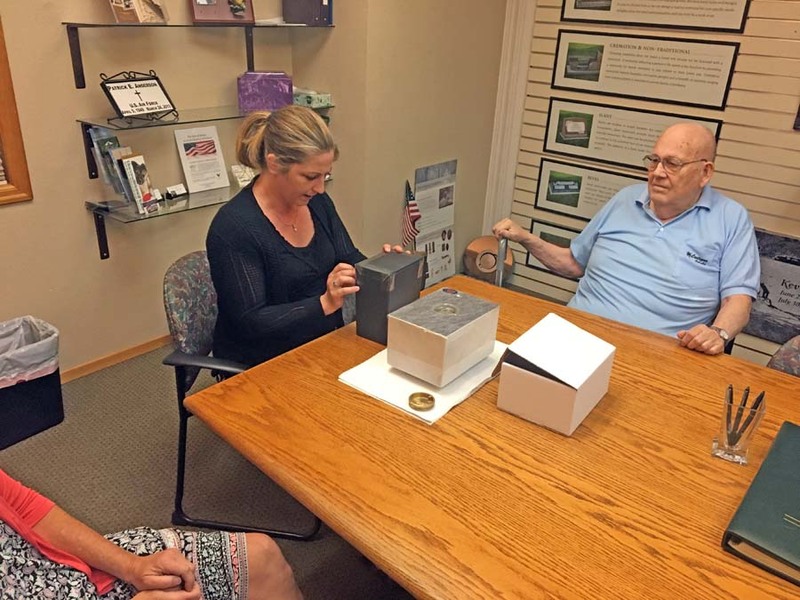 This is in case there is ever any doubt as to the identity, the casket can be opened and the medallion with the identification can be retrieved. The area was prepared for us earlier. 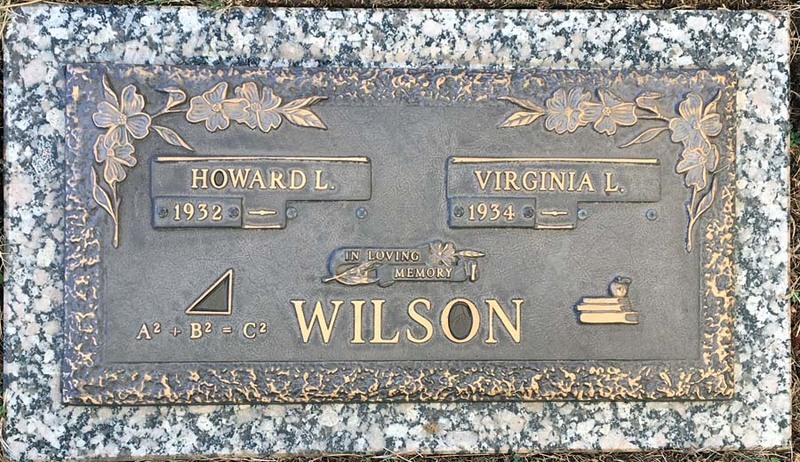 The headstone of Howard L Wilson and Virginia L. Wilson. The formula A2 + B2 = C2 is a reference to Howard and Virginia both being math teachers. The close family of Virginia Wilson gathered to inter her ashes. From left to right: Nathanael Hoffmann (Virginia's grandson), Cheryl Hoffmann in red sweater in front (Virginia's daughter), Brian Wilson behind Cheryl (Virginia's son), Katherine Chung (Brian's wife), Howard Wilson with cane (Virginia's husband), and Mark Hoffmann (Cheryl's husband), and Sadie (Hoffmann's dog). 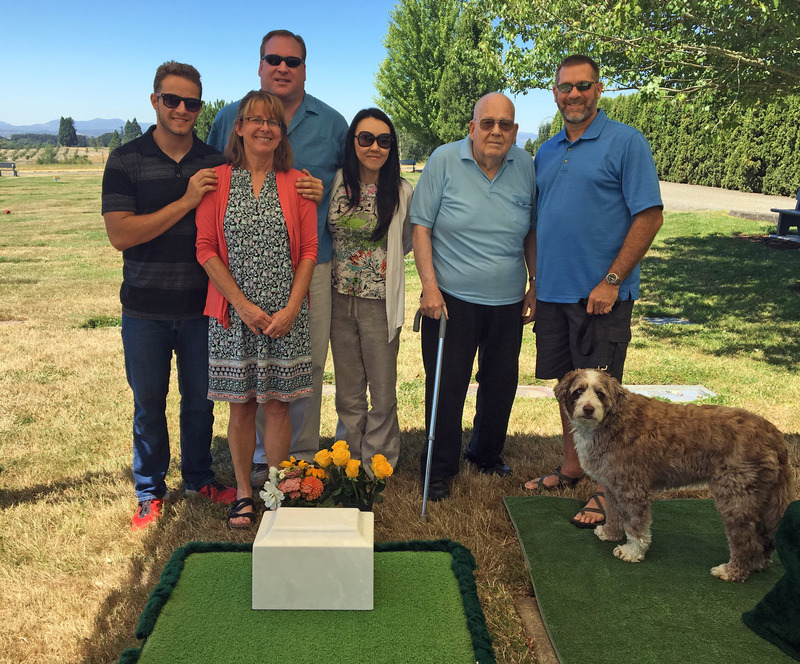 After Nathanael and Brian placed Virginia's ashes at the bottom of her grave. Below is a panorama of what the day was like. Very unusually great weather for Oregon. While we were there, we visited some of our relatives in this cemetary. 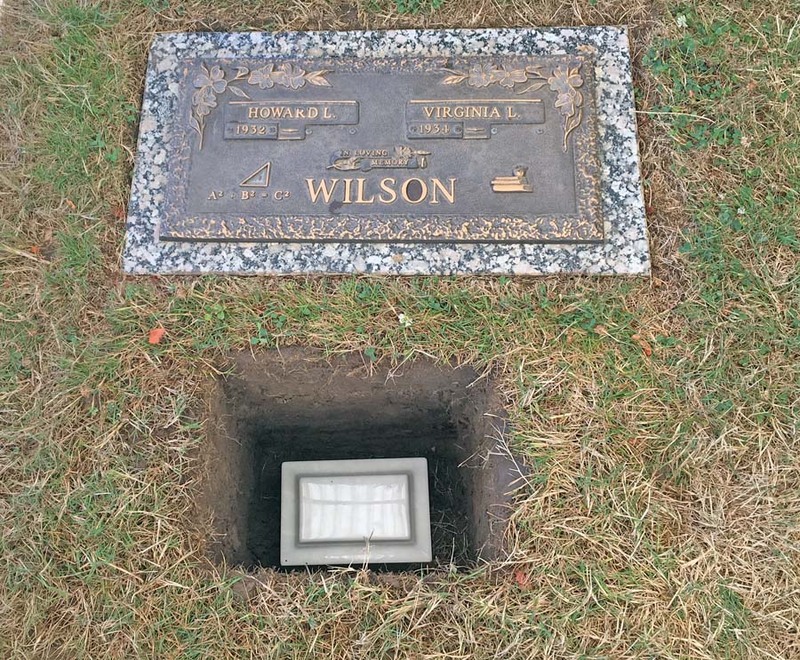 Below is the grave of Ralph A. Wilson (the 1st) and his wife Erma L. Wilson. Ralph was my (Brian's) grandfather on my father's side. Ralph's first son (the older brother of Howard) is buried here also. 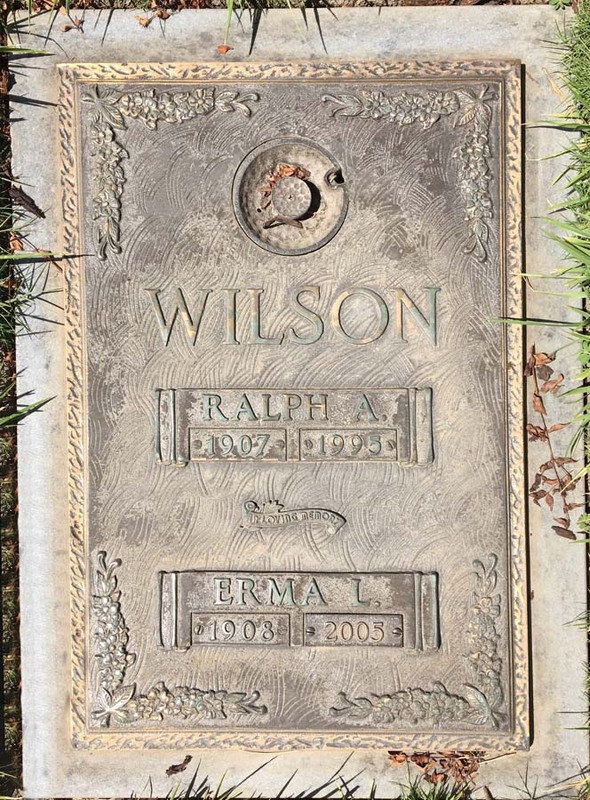 Below is a picture of Ralph A Wilson (Jr)'s tombstone. 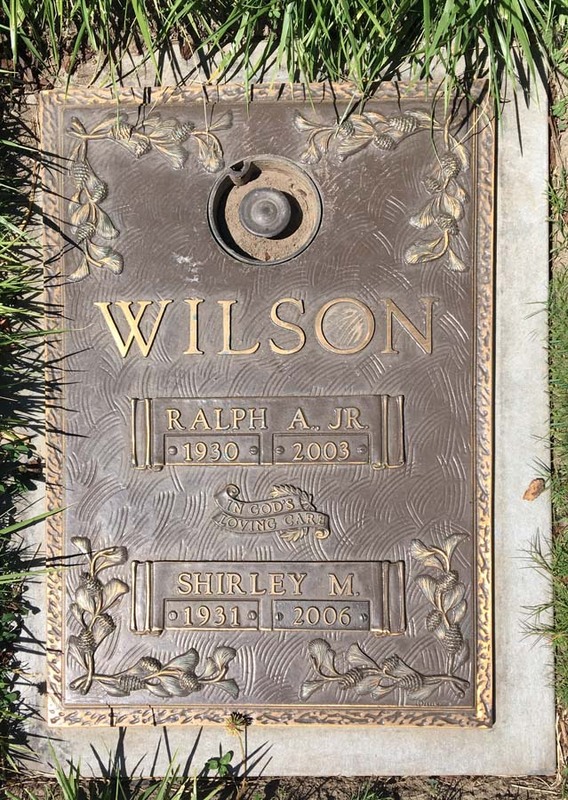 One of Ralph Jr's children is buried here also (making this three generations of Wilsons buried in this cemetery). 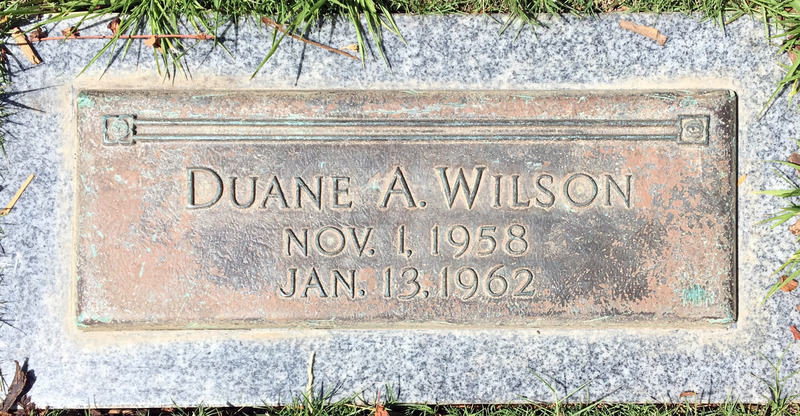 Below is a picture of the head stone of Duane A Wilson. And as we return to San Francisco, here are two videos (one video, second half) of Katherine opting out and getting a pat down from TSA in PDX (Portland Airport). Return to Ski-Epic home pagee.